We are writing to update you on our presidential search process and to thank you once again for your extraordinary hospitality during the interviews of our two finalist candidates for the presidency. We also appreciate your thoughtful and candid responses following both visits. Your feedback was insightful and invaluable. The Search Committee decided to recommend one of our finalist candidates to the Board of Trustees when, to our surprise and disappointment, the candidate withdrew from consideration due to family matters. The Search Committee decided not to move the other candidate forward in the process. The Search Committee then met to determine the next steps in our process and to recommend a plan of action to the Board of Trustees. The Board of Trustees met earlier today, Dec. 1, first with the Search Committee, and then in Executive Session. The Board of Trustees has directed the Search Committee to extend the search process as is typical in executive searches. We know that this is an unexpected development, but we have taken our charge to find the best leader for our College very seriously. Knowing the unwavering commitment of our College community, we are confident that we will find our next President in a timely manner. 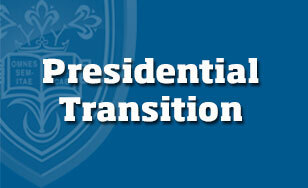 We are committed to maintaining our and the community's high expectations for the next President of the College. As always, we welcome your comments and questions and we thank you for your continued support. We will provide additional updates as information becomes available.